Most teachers are already pressed for time teaching to existing curriculum. Therefore, outside garden activities should enhance and tie into classroom curriculum whenever possible. The following questions will help assess the development of curriculum within a school. - Will the whole school use the garden or only certain classes? Will there be a flow of garden curriculum throughout the grades or will only certain teachers use the garden? - Determine which teachers have interest and experience in gardening and which have interest but no experience. 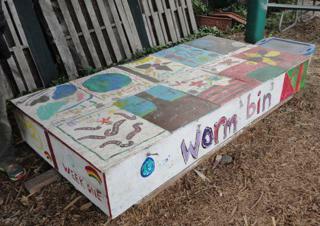 - Are there structures in place such as school wide composting, a reduce/reuse/recycle program, or a Green team that can support the garden curriculum? - Will parents lead the classes or parents and teachers together? Ideally, they should teach together. In this way, teachers can reinforce and enhance the student’s classroom-based activities with outdoor learning. - Determine the amount of time that a teacher is willing to commit to the garden. Weekly, monthly, or only at random as time allows. - Will there be a garden coordinator who can assist the garden curriculum integration?